Once upon a time it was used for all kinds of documents and books. It was produced from skins, usually sheep and goats, and taken through a process that ended up as a base for writing on. It was very durable and used for centuries. 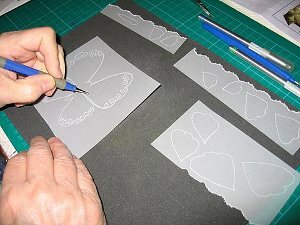 It is still used today in the manufacture of book bindings, lampshades, drums and tambourines, manuscripts and much more but for the card maker it is easier to buy the paper kind. 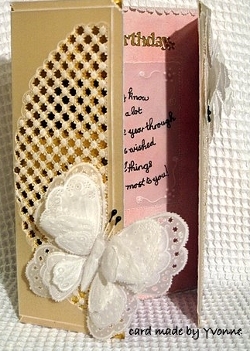 It can be used as inserts for the finished card with verses and poems printed on. 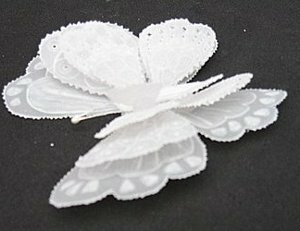 Use it as an overlay with a delicate pattern. 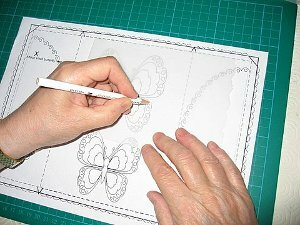 Today it involves various techniques such as using a white pencil to trace your chosen design. 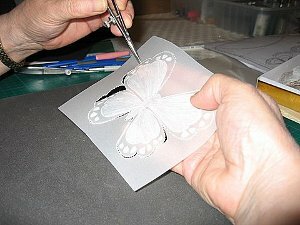 Embossing to produce a raised effect. 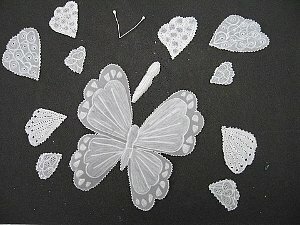 Laying out the elements of the butterfly, to make sure you layer them in the correct order. And the Beautiful finished result as created by Yvonne. And this is the completed card. Who wouldn't be thrilled to receive this card on a Birthday.